The early 1980s. Obviously a large reballasting job coming up. Mostly DOGFISH with some MERMAIDS, SEALIONS and old & new SEACOWS (far right). SHARK in foreground. Note slag ballast DOGFISH with extra extension boards on the hopper (left middle). 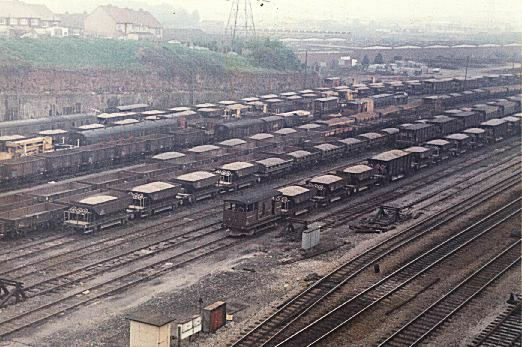 An SR (SECR design) Plough Brake Van is in the third siding from the rear, towards top right from the centre ("above" a Turbot). A GWR TOAD Brake Van is hiding from the breaker's yard at the rear. When this photo was taken the yard, and sidings nearby, contained over 100 Dogfish, or around 10% of the total fleet.